As you can imagine, the world would be a disgusting place without the garbage man. For many years people burned waste, fed it to animals, buried it, and most commonly, tossed it over their shoulder. Some cities became buried, and built over the waste, and others pioneered new ways to save their cities from vermin and disease. Recycling began as a necessity and ended up in present day as a responsibility to the environment. The most amazing thing about garbage collection is the fact that it was there in the beginning and it will be there in the end. It was part of the package deal when we hit this planet. Our consumerism in the United States only gets larger every day. This brief history summarizes some facts and fiction that helped keep our planet clean. 3000 B.C. – The first landfill is developed when Knossos, Crete digs large holes for refuse. Garbage is dumped and filled with dirt at various levels. 2000 B.C. – China develops methods of Composting/Recycling, and recycling bronze for later use. 500 B.C. – Athens, Greece develops new law claiming garbage must be dumped at least one mile from the city. The most dangerous disease to ever hit mankind broke out around 1350. 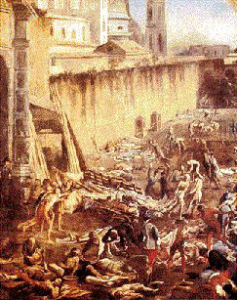 “The Black Plague,” killed 25 million people in just 5 years. People were very uncivilized in Europe, war was common, and anything that could be re-used was not wasted. Around this time Britain introduced their first garbage men, perhaps the first official garbage men in history. They called themselves “rakers,” and their job was simply to rake up the trash, into a cart, on a weekly basis. These men forged the way for the future of the garbage man. You can imagine trying to clean a filthy city, enduring tough physical labor, and trying to stay healthy while doing it. 1388 – The English Parliament bans dumping of waste in ditches and public waterways. 1551 – The first recorded use of packaging: German papermaker Andreas Bernhart begins placing his paper in wrappers labeled with his name and address. 1657 – New Amsterdam (now Manhattan) passes a law against casting waste in the streets. 1690 – Rittenhouse Mill, America’s first paper mill, opens in Philadelphia making paper from recycled cotton and linen as well as used paper. Around 1350 Britain passed a law mandating a clean front yard. However the law is not taken too seriously. Most garbage is still burned outside in fires. Around 1407 there is another law passed in Britain declaring waste must be stored inside until rakers remove it. Due to lack of new ideas and real motivation, there was not much to do with your waste during this time period. People would either burn their personal trash and bury it, or let it pile up. Nobody saw garbage as a threat to way of life until population boomed. This age of new waste disposal ideas included everything from saving dog feces to developing mass burn plants. Every new mind had a chance at saving its cities waste problems or making a quick buck. The Industrial Revolution was the beginning of more materials, trade, and machinery. Coal was one of the largest contributors to the revolution because it could produce more materials faster. Over 3.5 million tons was burnt in London in one year. Unfortunately, all the new production left used materials and created scavengers. Toshers, Mudlarks, and Dustmen, were nicknames given to those in England who gave a new meaning to dirty work. They would sell anything from dog feces (used to purify leather) to ash (added to mortar), for a buck. In order to prevent mass scavenging, and cleanup the country, the Public Health Act of 1875 was created to give authority for waste collection. The first concept of a movable garbage receptacle was created and they’d even charge you if it was empty! These bins were used to store ash waste and emptied weekly. Shortly after Britain came up with the most obvious idea; a giant burn plant to burn waste and generate electricity from steam. They built 250 “destructors,” all over Britain only to oppose all of them later due to ash and burnt paper floating all over the country. Around 1757 Ben Franklin started the first street cleaning service and encouraged the public to dig pits to dispose of their waste. We were even smart enough to melt down a statue of King George III and use it as ammunition against his armies. In 1885 America built its first incinerator on Governors Island, New York. 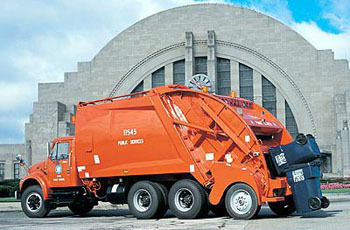 The Big Apple also developed the nations first comprehensive system for garbage management. We even tried Austria’s waste reduction plants which compress organic grease, oils and by-products from waste. Although, they were quickly vetoed due to nasty odors. 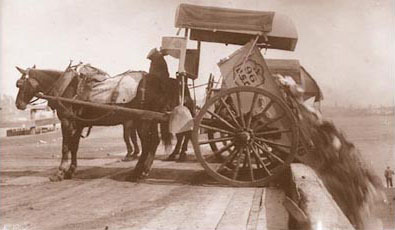 In 1908, dumping waste in the most convenient location was common practice. They would dump in the ocean, wetlands, or any given waste land. The U.S. didn’t set up regulations for another 25 years. The United States had developed some form of waste collection in 71% of 161 large U.S. cities. Most small towns and cities were using “piggeries,” which were small pig farms designated to consume the town’s raw and cooked food waste. 75 pigs could consume about one ton (2000 pounds) of food waste each day! Anything that wasn’t food waste was most likely burnt or buried. The move into the new century demanded planning for our nations waste, and our country was starting to become more civilized. The first aluminum recycling plant opened in Cleveland and Chicago, and more than 100 incinerators closed due to noxious smoke. In 1914 after much trial and error incinerators gained more popularity, and about 300 were in operation from the U.S. through Canada. 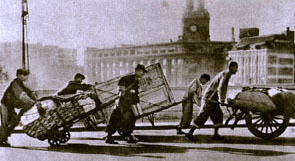 Shortly after the horse drawn motor carts are replaced by motorcars and garbage men are very happy. Toward the end of this time frame landfills are becoming more popular and the methods included dumping at wetlands and covering with soil. This old covered body truck was very popular but posed a problem because the driver had to lift the can above his shoulder. It beat the open truck’s spillage but locked in the smelly waste. In 1934 the Supreme Court banned the dumping of municipal waste into the ocean, which had become very common up to this time. Shortly after the U.S. engaged in warfare and the rest of the country made efforts to clean up by recycling rubber, paper, scrap metal, and tin cans (25% of waste stream). Around 1945 100 cities in the U.S. were using sanitary landfills. After the war, open burning dumps and backyard waste burning was prohibited in most areas. Consumerism reaches an unbelievable high due to the ease of plastics, and America has been named the “throwaway society.” The amount of packaging produced and disposed of increases 67% after World War II. In 1956, the Clean Air Act is passed in Britain (U.S. soon follows) and most household heat is replaced with gas and electricity. Since nobody can burn their waste to ashes anymore, quantities of paper, packaging and food are much larger. Around the 1960’s our industries pioneers formed the National Association of Waste Disposal Contractors to conduct private waste hauling. Around the 1920’s the rear loader was developed. It lifted the garbage can from the back up to the top of the truck and allowed more efficiency. 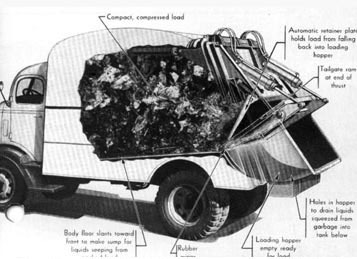 The Garwood Load Packer was the first truck to use hydraulic blades to pack and push the garbage into the back of the truck. This was the first technological breakthrough combining hydraulics and packing capabilities. 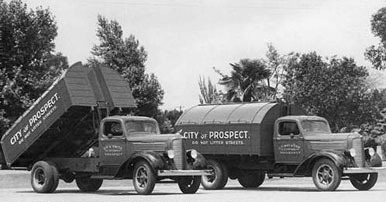 Around 1950 the residential collection truck was changed to a side-load process. After the garbage was loaded it was packed into the back of the truck with a huge hydraulic powered blade. This technology remains today. 1965-Solid Waste Disposal Act- The Government authorizes research on site inventory, resource recovery, landfill research and also provides state solid waste grants. In 1968 more than 33% of U.S. cities waste is separated in some manner. Shortly after President Nixon created the Environmental Protection Agency, recycling resources and overall environment become a major concern. Around this time the concept of the “Transfer station” was introduced to help larger cities manage more waste. 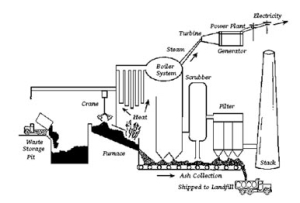 Transfer stations are large warehouse buildings designed to package waste, then transport the waste to incinerators or large landfills further away. They help waste haulers cut down on long travel times to distant landfills. These stations saved many large cities because the haulers were able to collect more waste in a shorter time. Many states start recycling programs like pay-per-can, buy-back and newspaper curb recycling. In 1976 the Resource Conservation and Recovery Act is created to plan for recycling, conservation and waste management. Toward the end of the 80’s the EPA sets a 25% waste reduction/recycling goal which is achieved shortly afterward. Amazingly twenty-six states have laws regulating recycling. In 1971 the Maxon Barell Snatcher was introduced to waste haulers. It was nicknamed “Godzilla” for it’s mammoth size and ability to pick up 300 gallon containers over its head. It was replaced later by a mechanical side-load model still used today. “Godzilla” proved that too much size is not always the most productive – although it is still a personal favorite. After the world realized the dangers of hazardous waste, and the benefits of recycling there was only one thing left to consider; waste disposal technology. How do we collect this waste faster, cheaper, and more safe? The 90’s became the age of the refuse truck. During the 90’s many companies made huge breakthroughs with hydraulics, engine power and safety. In 1991 the EPA set standards for landfill groundwater protection, monitoring and post closure care. These standards were very significant for future sites because they demanded standards that would save the future of landfill operations. Meanwhile more than 3000 household hazardous waste programs have been setup in all 50 states. Around 1994 President Bill Clinton issued executive order 12873, which required federal agencies to buy and use recycled, and use environmentally safe products. He created the Office of Federal Environmental Executive to enforce the order. In 1996 the nation reached their goal of 25% recycling rate, then turned around and set 35% as the new target. During the 80’s and 90’s the EPA monitored all waste contents and recycling rates to measure what we waste most and what we can do about it. In 2000, more than 5000 U.S. cities are using Pay-as-you-throw programs, which charge residents based on amounts of garbage they throw away. 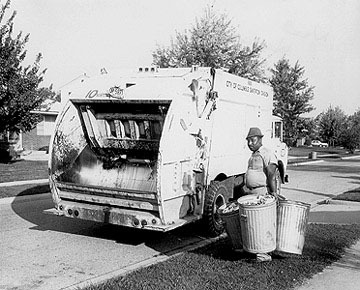 From 1990 to 2000 technology of Garbage trucks changed dramatically. All different types of trucks have large powerful hydraulic arms and packers. They are able to pack and haul two or three times more garbage than the first models. Below are some of our industries newest and most current trucks. Each caption explains what the trucks operational purpose is and how it compares to others. The Rear Load Truck was very popular throughout the 80’s because it could dump large rear load containers and accept hand-throw bags. This modern day model also dumps residential cans. It’s only disadvantage is its slow time, or two drivers need to operate this truck because someone needs to hook up and operate dumping from the back of the truck. The EPA’s studies continue to help us understand our waste problems and how we can fix them. They continue to help us understand the dangers of substances, water contamination, medical waste, incinerators and much more. If you are interested in further study of this subject please visit the EPA’s website for more info. The modern front load truck dumps overhead the drivers cab. This truck is primarily used for commercial businesses, apartment complexes and strip malls. It is the most efficient because it can pick up a variety of stops and cans very quickly. The rear loader still has the same design as it did 40 years ago. A large hand like blade grabs the garbage out of the back basin and pushes it up to the box of the truck. It is not common in Utah but used in large cities, special accounts, and hand throw trailer courts. The Roll Off truck loads the box with a winch and lever technique. It is used to load compactors (supermarkets), and construction boxes (as seen here). It can pull 20 tons on its rails and is equipped with a powerful engine and frame. 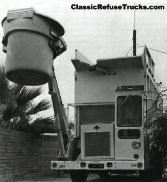 The residential truck has two curved arms that wrap around the can – then the track pulls the can up and into the opening (you can see the arms at the top of the track in dump position). This truck is primarily used for residential cans from 50-300 gallons (a home can is 95 gallons). Some of the larger 300 gallon cans are used for business. Special thanks to pictures provided by manufacturers: Milestones in Garbage, US E.P.A. Municipal Solid Waste.